Today I bring you autumn in a bowl. 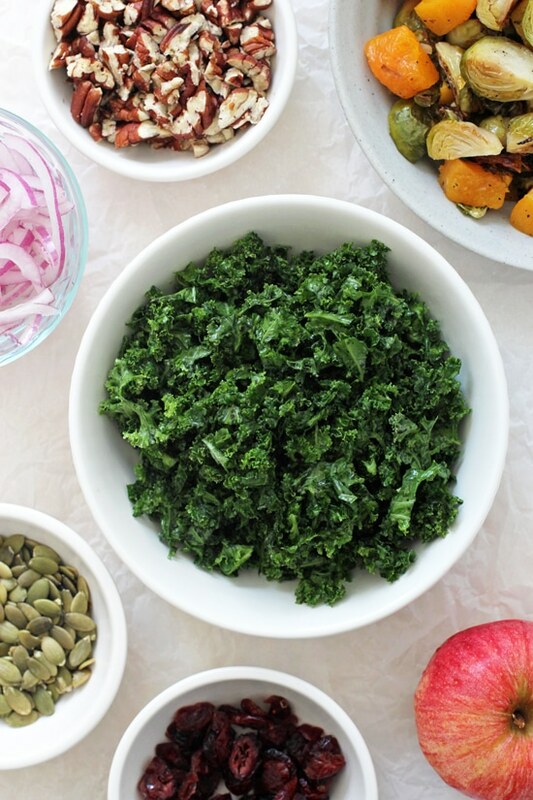 Because this fall harvest kale salad? It is packed to the brim with alllll the goodness that this season has to offer! Butternut squash? Check! Cranberries + pecans? Check check! Crisp apple, pumpkin seeds and a dreamy maple vinaigrette? Check check annnnd check! But. I feel like I am getting ahead of myself … because that’s not even the full list of everything that this deliciously crunchy, healthy and hearty salad has to offer. So let’s back it up a bit, shall we? And go through each of the components of this delectable dish. We start by roasting up a big tray of fall vegetables – i.e. butternut squash + brussels sprouts. While the veggies get all perfectly tender and caramelized in the oven, we add a hefty amount of sliced kale to a bowl and give it a good ol’ rub down to improve the flavor and texture. Next! We whisk together a simple maple mustard vinaigrette and prep a few extra mix-ins, like red onion, fresh apple, dried cranberries, pecans and pumpkin seeds, that add just the right amount of crunch to the final dish. It all gets tossed together and your salad is served! It’s fantastic for an easy dinner (especially if topped with a cooked protein of choice!). Or, it also has some serious Thanksgiving-y vibes and would make an awesome dish for the holiday … seeing as how it can be made completely in advance. <— Yessssss. Not to mention that it’s gluten free, grain free and vegan – making it perfect for a slew of dietary needs. Dear fall – we love you and all your delicious vegetables. Oh yes we do! First things first. Let’s talk how to prep this dish to cut down on the overall recipe time. Get the roasted veggies going in the oven first and then prep the kale, make the dressing and chop up everything else for the salad. You’ll have plenty of time while the veggies are roasting and this will shave off about 18 to 20 minutes from the total recipe time. I use pre-cut butternut squash when making this salad (either store-bought or prepped by me in advance). So if you are cutting up a squash right when making, please keep in mind the prep time will be longer. As with any salad, feel free to adjust the mix-ins to your taste. Want to use walnuts instead of pecans? Go for it. More or less sliced red onion? Rock on! Extra apple? Try it out. Experiment and find what you love. This salad works great as either a main dish or side. If I’m serving this as a main, I like to top with a cooked protein of choice. If you’re serving it as a side, it is fantastic just as is! Additional Healthy & Hearty Salad Recipes You Might Enjoy! 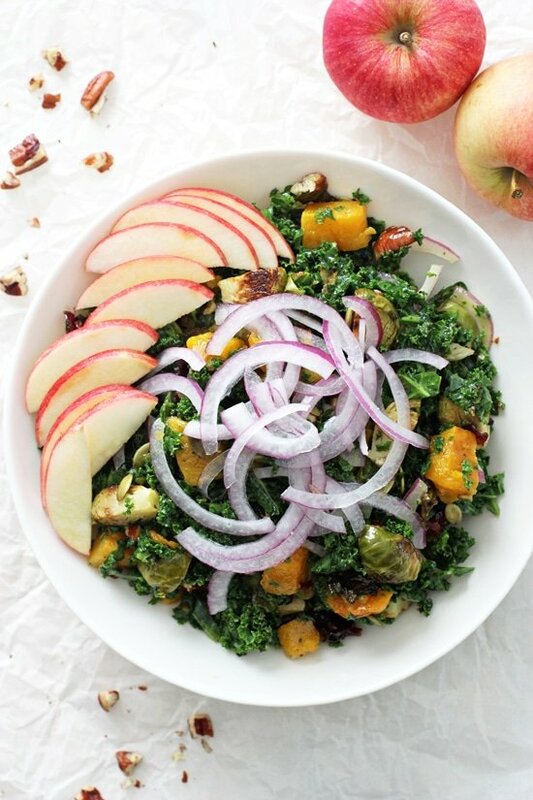 Easy fall harvest kale salad! 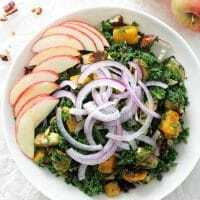 This hearty and healthy salad is filled with massaged kale, roasted brussels sprouts, butternut squash, crunchy pecans and sliced apple! All tied together with a dreamy maple vinaigrette! Vegan and gluten free! And perfect for the holidays! Add the butternut squash and brussels sprouts to a large rimmed baking sheet. Drizzle with the olive oil, then sprinkle with the salt and pepper. Toss to combine, then spread in an even layer. Bake for about 25 to 30 minutes, stirring once halfway through, until tender and starting to brown. Remove from the oven and let cool for about 10 to 15 minutes. Meanwhile, add the sliced kale to a large bowl then sprinkle with a pinch of salt. Use your hands to massage the kale – grab handfuls and gently scrunch. Continue massaging until the kale is darker in color and has reduced a bit in volume. Set aside. In a small bowl, vigorously whisk together the olive oil, maple syrup, mustard, vinegar, salt and pepper until smooth. Set aside. 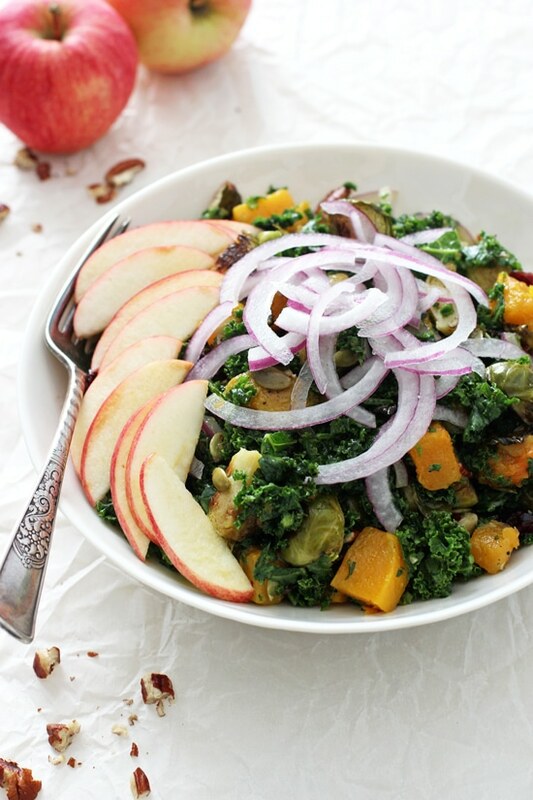 To the bowl with the kale, add the cooled roasted veggies, the pecans, pepitas, red onion, apple and cranberries. Pour in the desired amount of dressing (I use it all!) then toss to combine. Taste and season with additional salt / pepper as needed, then serve!